I’ve never picked Stephen Harper because, duh, obviously the Prime Minister is going to have an impact on politics. And 2014 was no exception. In a year which was very much the prelude to the 2015 election, it was inevitable that Harper would be front in centre – would he call an early election? Would he take a walk in the snow? What would he do with the surplus? So if you strip Harper away, who does that leave? The attacks on Parliament Hill stunned the country and will not be soon forgotten, but I doubt terrorism and security will be the defining issues of the next election. Kevin Vickers deserves every honour we can bestow but we’re singling out individuals who made a political impact, not heroes. The death of Jim Flaherty was another tragedy that exposed the human side of politics. But with the exception of Flaherty’s doubts on the merits of income splitting, Joe Oliver has largely continued on the course his predecessor set. 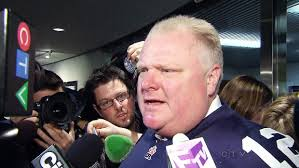 The real world also cast its ugly shadow into the surreal world of Toronto municipal politics, with Rob Ford’s cancer diagnosis. Although John Tory winning something is a small miracle, he was elected precisely because he won’t inspire national and international headlines. So expect his impact on the national scene to be rather muted in the coming years. So we’re left looking to the provinces for our person of the year. And there are no shortages of candidates. 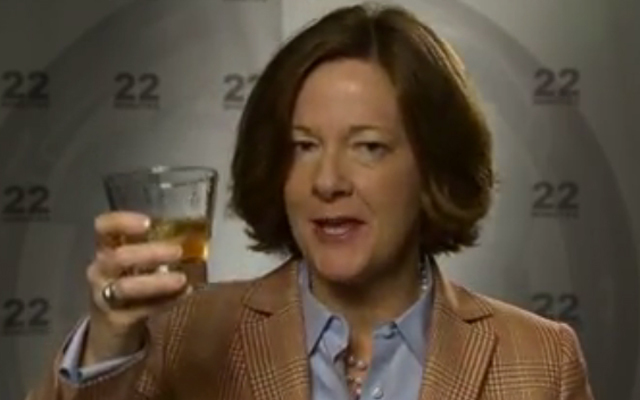 The implosion of my 2012 Person of the Year Alison Redford was breathtaking, and might very well be the deathblow to Canada’s longest serving government…Oh wait. Who’s that riding into town on a horse to save the day? Why, it’s Jim Prentice. In only a few short months, Jim Prentice has taken the PCs from death’s door to a point where they are basically guaranteed to govern until 2020. Obviously enough, one of the all time great capitulations by Danielle Smith helped. The only thing holding me back from naming Prentice as my Person of the Year is that these “out of the ordinary” events have become rather ordinary in Alberta. As the cliché goes, these are just the sort of things that happen to governments during their 12th term. Elsewhere, the Manitoba NDP and Newfoundland PCs are in the process of imploding, and seem destined for defeat unless they can find their own Jim Prentice. New Brunswick said hello to a new Premier, and PEI said goodbye to theirs. In Quebec, Philippe Couillard‘s victory doesn’t feel so surprising, but we forget how certain everyone was of a PQ victory. One PKP fist pump later, and no one is talking about another referendum. 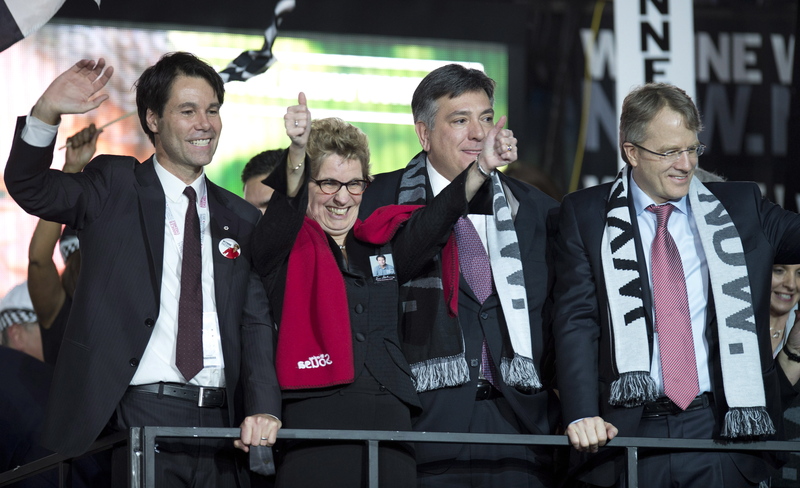 Although Kathleen Wynne led wire-to-wire, her victory was far from certain. The Liberals were going for a fourth mandate, and many die hard Liberals privately acknowledged they didn’t really deserve re-election. Baggage has a way of building over 10 years, and Wynne did not enjoy Prentice’s ability to come in as an outsider with clean hands. Hudak and Horwath both had paths to victory, and a scenario where the Liberals got squeezed to third place wasn’t outside the realm of possibility. Yet Wynne was bold, and proudly progressive. Her opponents certainly made life easier for her, but she was a rookie against two leaders who had done this before. And she won. Decisively. Though many in Ontario would disagree, Ontario is not Canada. Yet behind the scenes, the Ontario election served as a testing ground for the federal parties, and the lessons learned will be applied federally. Mulcair’s sharp turn to the left this fall was no doubt a response to the backlash Horwath saw for running to the right of the Liberals. And the Tim Hudak campaign of 2014 will serve as a cautionary tale for decades to come. Since her win, Wynne has inserted herself into the national dialogue in a way Ontario Premiers have been shy to do in the past. Kathleen Wynne may not look or sound like Danny Williams or Ralph Klein, but she appears eager to assume the title of chief antagonist to the Prime Minister. Regardless of whether or not she ever gets her dinner date with Stephen Harper, she’s a player on the national stage. That will matter if Ontario turns into a battleground in 2015, as most expect. On pensions, on pipelines, on the environment – expect Wynne’s voice to be heard not just in Ontario, but nationally. 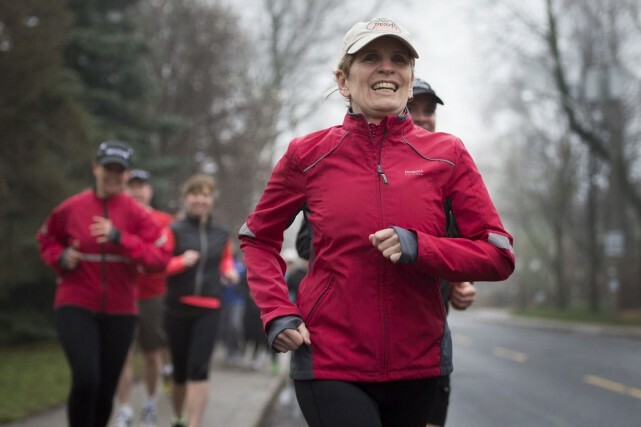 We know Kathleen Wynne likes to run, but this spring she was running against 10 years of baggage, a widespread time for a change sentiment, and more scandals than the opposition could fit in a 30-second TV spot. Luckily, she was also running against Tim Hudak. Given these challenges, the election was Hudak’s for the taking (or Horwath’s – more on that later). Out of the gate, he claimed control of the agenda, dominating the headlines every day. This was a page out of the Harper 2005 Playbook, when he took a break from Gomery to announce his 5 priorities. For Harper, it was very much about reassuring voters he was fit to replace a government most were ready to replace. The problem for Hudak was that the agenda he laid out was nothing at all like Harper’s. The 5 priorities were populist fluff few could disagree with – a GST cut, a wait times guarantee, an accountability act, cash for parents, and tough-on-crime legislation. Some may not have agreed with them, but it’s hard to be against tax cuts. Harper suddenly looked less scary than the private healthcare, pro-gun, anti-abortion caricature that had been drawn of him two years earlier. By showing his agenda, he eased fears about a hidden agenda. 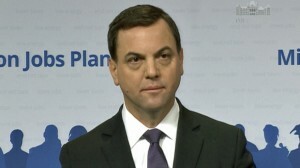 However when Hudak took control of the campaign, he showed an agenda that was just as harsh as anything the Liberals could have accused him of hiding. By inviting controversy, the debate became all about Hudak rather than the Liberal record. Most shocking was his pledge to axe 100,000 public service jobs, something the Liberal campaign pounced on and didn’t let go of. Suddenly, Hudak was playing defense on what he hoped would be his strongest turf – jobs. It certainly didn’t help that his math was (once again) suspect. Despite a strong debate performance by the PC leader, the ballot question had already shifted from change and corruption to Hudak’s plan. That left a suddenly centrist Andrea Horwath squeezed out of the picture with little to say – another abject failure for the NDP, on the heals of disappointments in Nova Scotia and BC. The Wynne campaign, meanwhile, kept a laser focus on Hudak. When forced to talk about their own plan, they wisely steered the conversation to pensions – the one clear idea in a rather smudgy financial blueprint. Winning elections is all about framing the election around the narrative you want, and that’s what Wynne was able to do…by letting Tim Hudak control the agenda. 1. Obviously enough, these numbers spell bad news for Darrell Dexter and Christy Clark, who are both heading into elections considerably less popular than the opposition leaders trying to defeat them. Still, it’s worth recalling that this same poll found just 19% of Ontarians approving of McGuinty a mere 10 weeks before re-electing him in 2011. Sometimes you can win without being loved. 2. The danger may be less imminent in Newfoundland and Alberta, but the Tory dynasties in both provinces must be feeling a bit like the New York Yankees this season – it’s far too early to count them out, but you have to wonder if this is the begining of the end. Redford’s numbers are right around where Ed Stelmach’s were when the Tory establishment mounted a putsch 2 years ago. Like Stelmach, Redford won with little caucus or establishment support, and has struggled to keep up with the Wildrose fundraising machine. I don’t think the Tories will or should force her out, but when your approval rating is below Raj Sherman’s, you need to at least watch your back. 3. A lot of Ontarians still haven’t made up their minds about Kathleen Wynne. 4. The most surprising finding, at least for me, was that the Premier of New Brunswick is named David Alward. Who knew? Goodbye Minister of Finance Takhar. Hello Minister Responsible for Seniors Takhar. You win some, you lose some. Or so I hear. 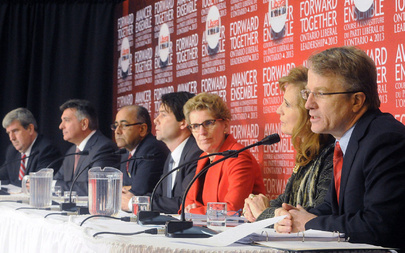 Regardless, win or lose, we can all take home valuable lessons from the OLP leadership race – and with no fewer than 5 other Liberal leadership races ongoing in Canada, these are rules all Liberals should heed. Nice almost always beats arrogant when it comes to delegated conventions. 2. Leadership races are more about values than policy: Glen Murray was probably the most substantive candidate in the race, and he didn’t make it to the convention. Harrinder Takhar and Charles Sousa had reams of economic plans, but few took notice. On the other side, I bet half the delegates at Maple Leaf Gardens couldn’t name a single concrete policy proposed by either of the frontrunners. Again, this isn’t anything new. In the 2006 leadership race, Stephane Dion had green scarves, handed out tree seeds at events, and talked a lot about the environment, but it was Michael Ignatieff who actually proposed a carbon tax. Yet it was Dion who owned the issue and rode it to victory. Even though she didn’t win, Pupatello’s “Jobs, Jobs, Jobs!” focus with few details to support it up was exactly the right card for her to play. Sometimes you need policy to define yourself, but it rarely proves to be the decisive factor. 3. You snooze you lose: Timing is everything in politics, and the stars seemed aligned for Gerard Kennedy. He offered the party its best opportunity to rebuild its relationship with teachers. His years away from Queen’s Park meant the OLP could move beyond recent set-backs and reboot. Every poll showed him to be the most electable candidate, at a time when the Liberals are in very real danger of losing the next election. Yet Kennedy waited to get into the race, leaving him barely 10 days to put a team together and sell memberships. 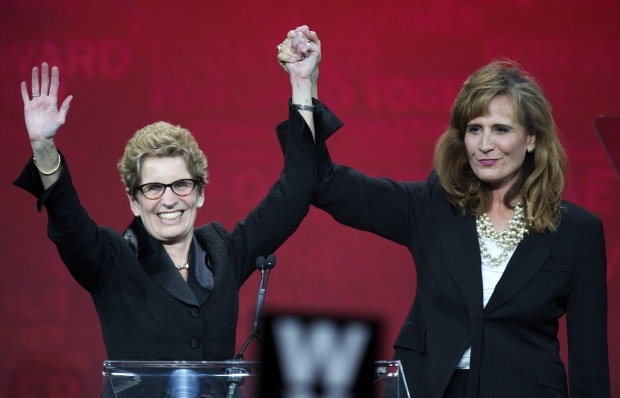 By the time his campaign was in gear, Pupatello and Wynne – who had been planning this for years – had already snatched up most of the key organizers and the “may the best woman win” narrative had already been framed. Every contest is different, but I suspect Martin Cauchon’s last minute entry to the LPC leadership race will leave him facing many of the same challenges. 4. You can win by losing: If anyone ever wonders why candidates who clearly have no shot of winning enter leadership races, take a look at what Cabinet Portfolios Charles Sousa and Eric Hoskins find themselves with next week. 5. …but not always: Conversely, the rise and fall of Harrinder Takhar shows there are no guarantees. After a strong showing at the delegate selection meetings, Takhar appeared poised to be the kingmaker and a power player in the party moving forward. After a week of bad press and a clumsy convention floor endorsement of the runner up, Takhar’s stock is now lower than it was before the race began. 6. Confront tough issues head on: Kathleen Wynne could have danced around the issue of her sexual orientation, even after the Toronto Star declined to endorse her because she was a lesbian. Instead, she met it head on in what was universally regarded as the best speech of the convention. 7. Never bring Dufflet chocolates when you go a courting. The mainstream media coverage of this weekend’s OLP leadership convention has focused on backroom deals and electoral implications – but this misses the very human element of leadership conventions, which is where blogs still hold a certain degree of relevance. I therefore encourage everyone to read the following accounts – Misters Goldenberg and Hopkins, especially, provide powerful illustrations of just how meaningful Kathleen’s win was for many. On Saturday, Maple Leaf Gardens was a cauldron of emotions. There were tears, broken promises, dashed dreams, and shrieks of pure unadulterated joy. That’s to be expected when you bring 2,000 people with very different motivations and beliefs together, and ask them to figure out who will govern a province of over 12 million people. That means 40 delegates either didn’t vote or ate their ballots – including at least one Takhar delegate, unless Harrinder forgot to vote for himself. The real story of this was Wynne picking up over 40% of the uncommitted voters. 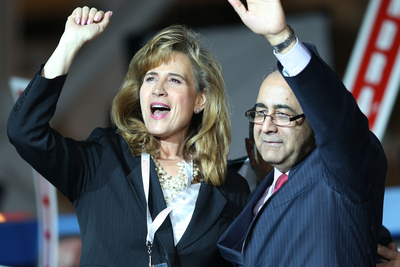 Pre-convention reports had her 10-15 behind Pupatello in the ex-officio count, so it seems likely she was able to snag most of the independent voters – and I guess that shouldn’t be too surprising, given many of them were former Glen Murray supporters. Until we read the tell-all memoirs in 20 years, we won’t know for sure what was going through each candidate’s head at this point, but Wynne’s bounce certainly shifted the odds in her favour, perhaps prompting Hoskins to also shift his endorsement. It also meant the path to a Kennedy victory now relied on more aggresive math – with Hoskins moving to Wynne, Kennedy would have needed at least three-quarters of Takhar and Sousa’s delegates to reach the final ballot. This likely killed any talk of a third option, explaining Takhar’s bizarre move to Pupatello after the deadline to withdraw. With the race now clearly a two-woman show, Kennedy was only able to grow by 4 delegates, and Sousa fell by 19. While no candidate is ever able to deliver 100% of their delegates, both the numbers and what I saw on the floor suggest that’s almost exactly what happened. 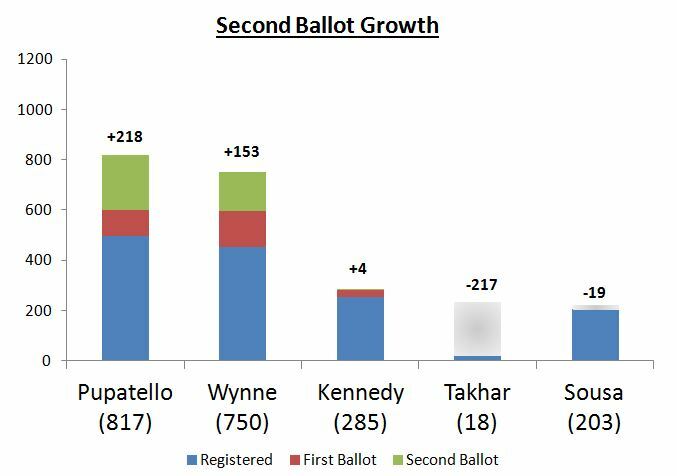 Pupatello’s vote jumped by 218 – toss in the 18 confused Takhar delegates who voted for their unofficially withdrawn leader, and you nearly hit Takhar’s first ballot number on the money. Similarly, Wynne’s gain of 153 was nearly spot-on to Hoskins’ first ballot total (though some high profile Hoskins supporters did go to Pupatello, including the Right Honourable John Turner). While Kennedy and Sousa could have stayed around and pushed the inevitable back to midnight, both recognized the reality of the situation and withdrew. 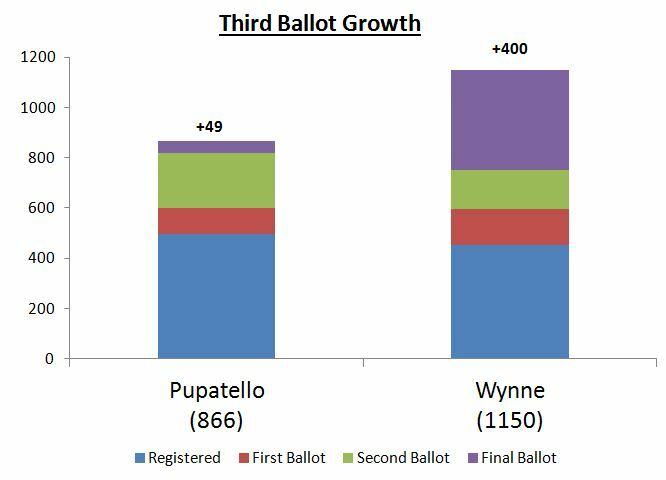 A Sousa-to-Pupatello and Kennedy-to-Wynne scenario would have set up an interesting final ballot, but it does not appear that either candidate nor their supporters had much appetite to back Pupatello, whose team had spent much of the campaign belitleling them. Both men marched to Wynne, effectively sealing the deal. Unless the protestors outside burned the building to the ground, the math was now such that there was virtually no way for Pupatello to hold her lead. 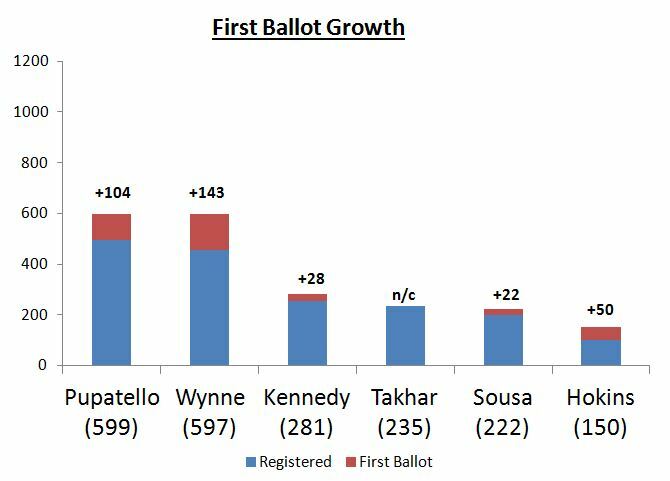 Together, Kennedy and Sousa moved 89% of their vote to Wynne on the final ballot – remarkable when you consider the historical norms, but likely in line with what Takhar and Hoskins also delivered. Perhaps the timid nature of the campaign left most delegates without strong feelings towards either of the frontrunners, so they figured they might as well follow their man. Perhaps the short timeline gave candidates little time to woo delegates for second ballot support. Perhaps the four defeated candidates all commanded an unusually high sense of loyalty from their troops. Whatever the reason, this convention came down to cold, hard, delegate math. And the math worked for Wynne a lot better than it did for Pupatello. I’ll post a recap of the weekend that was and thoughts on the road ahead tomorrow, but for now let me take a moment to congratulate Kathleen Wynne on her well deserved victory. She’s a likable candidate with an impressive record who ran a great campaign, and I was proud to vote for Ontario’s first female and first openly gay Premier on the final ballot. It’s a fractured field, and that becomes even more apparent when you consider no candidate received over 22% of the actual votes cast. It will come down to the convention, at which point delegates will be free to jump any which way after the first ballot. As history has shown, delegated conventions are unpredictable beasts, so it’s anybody’s guess who exits Maple Leaf Gardens as Premier in 10 days time. It’s been hard to get any kind of quantitative read on how the candidates stack up in the Ontario Liberal Party leadership race to date. Gerard Kennedy may be leading the polls among Ontarians, Sandra Pupatello may be winning the endorsement race, and Kathleen Wynne may have raised more money dough than anyone else, but none of those numbers give us anything more than a hint of how rank and file Liberals will vote at the delegate selection meetings this weekend. This leadership race is following the same format as the 2006 federal race (albeit under a much, much shorter timeline), and it should be noted that the number of people running as delegates was the variable most strongly correlated to first ballot support in that contest (r = 0.96 for you math nerds) – even more so than polls among party members. It’s not an exact measurement – in ’06 Bob Rae did far better than his “Form 6″ totals suggested he would – but it certainly gives us an idea of how the contest is shapping up. And that shape confirms what most have suspected for a while – Wynne and Pupatello are out in front, but neither of them are likely to crack 30% on the first ballot, leaving those in the pack well positioned for a Dion-esque or McGuinty-esque convention charge. The only real surprise from Monday is Eric Hoskins, who has gone from the presumed 7th place finisher to a legitimate challenger – if his support translates into delegates this weekend. But the picture is still fuzzy and will likely stay fuzzy until after the delegate selection meetings, at which point we’ll have a much better idea of how creative the math needs to get for each candidate to chart their path to victory.